1. Roast your cauliflower: Preheat oven to 400F. 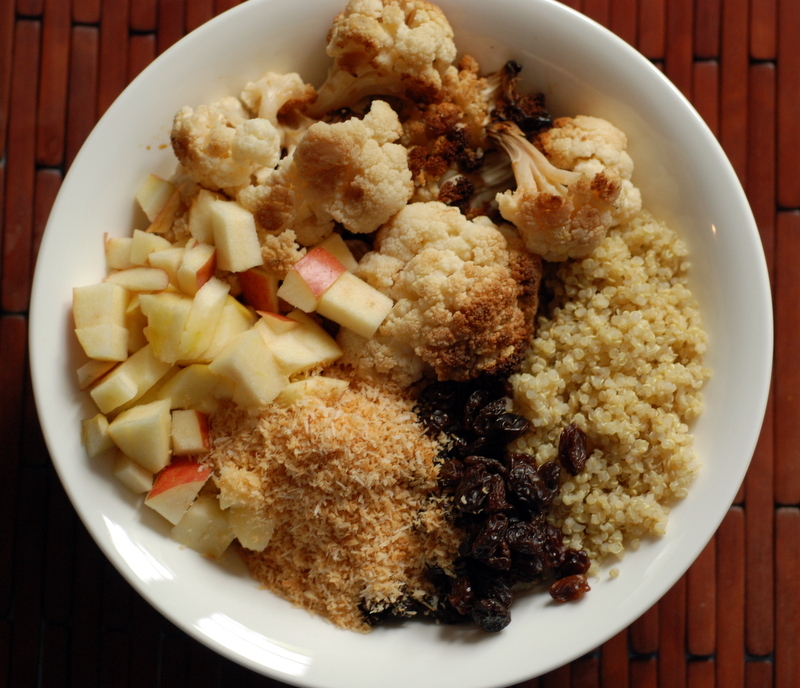 In a large bowl, mix together the cauliflower florets, oil and sprinkle with salt and pepper. Even space the cauliflower onto 2 silpat-lined baking trays and roast for 40 minutes, stirring half-way through. Remove from heat and allow to cool slightly. 2. Prepare your quinoa: Bring a scant cup water and nutritional yeast to a boil over high heat. Once boiling, add quinoa. Reduce the heat to low, cover and simmer until all of the liquid is absorbed, about 15-20 minutes. Keep covered for an additional 5 minutes to steam. Set aside to cool. 3. Meanwhile, chop your apple and toast your coconut. 4. In a small bowl, combine dressing ingredients: tahini, lemon juice, apple cider vinegar, water, Bragg’s/soy sauce, maple syrup and curry powder. 5. 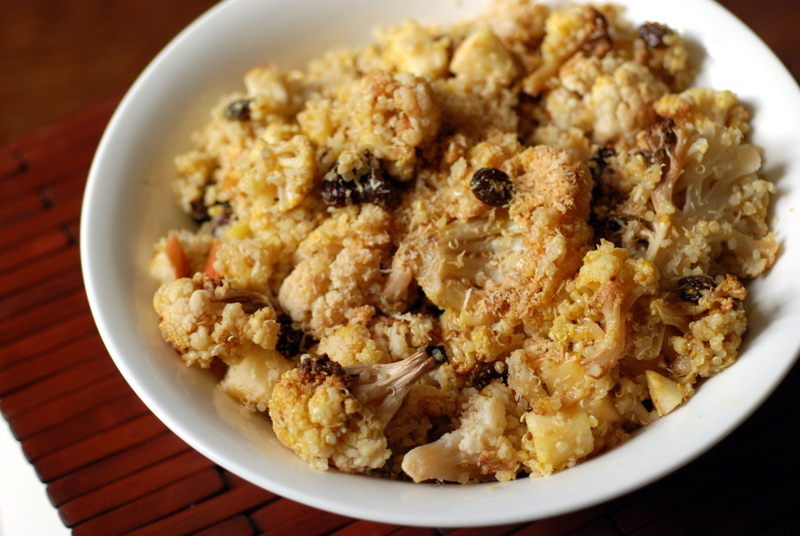 In a large bowl, combine roasted cauliflower, quinoa, apple, raisins and coconut. Prior to serving, drizzle with as much dressing as desired. This looks so delicious and full of flavor! I love the addition of the apples and honeycrisp are my favorite apples ever. I also love tahini. It sounds wonderful. new season apples are the best! sounds like a great salad – probably better for our spring weather than your autumn 🙂 though our apples are well past their peak. It was 30 C here on Friday and it was so hot that I was worried how I would cope when it was proper summer. 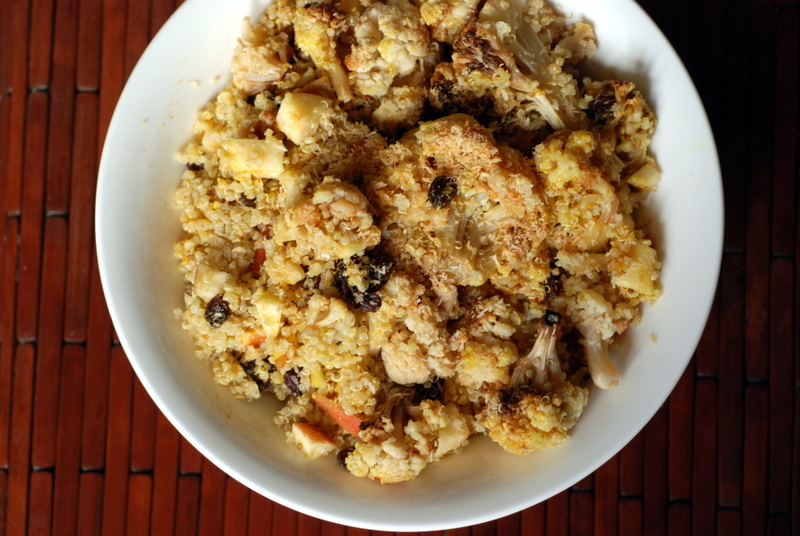 Now this is a cauliflower recipe I could get into. Perfect fall food. i’m seeing roasted cauliflower everywhere and i love it. this salad looks delicious and so comforting in all the right ways. Oh, how lovely. Such a balanced dish with lots going on. Thanks for sharing with NCR. No snow here, but the ground is a little icy in the morning, I live in the Welsh valleys, so we will def. see the snow, but not right now (thank goodness). Your salad is lovely and those Indian flavours excite me, thank you so much for sharing with Vegetable Palette, please check out the new challenge tomorrow.